Tom Bailey has taken 16 wickets at 11. 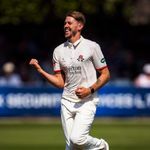 Tom Bailey voted PCA Player of the Month for April Lancashire seamer pips Nottinghamshire’s Jake Ball to award Last Updated: 03/05/18 10:42am Tom Bailey has taken 16 wickets at 11. Bailey secured 40 per cent of the vote with Ball in second place after 36 per cent of supporters thought he was the star performer in a close vote to champion the best performing players across the opening month of the season. After taking eight wickets in his opening two Specsavers County Championship fixtures of the season, it was Bailey’s third performance of the season which catapulted the opening bowler into the top four of the overall MVP. Bailey in full flow down the order for Lancashire against Surrey He backed his performance with the ball up in the second innings in the pursuit of Lancashire’s first victory of the season. It was not just Bailey’s performance with the ball which won the plaudits, his 118-run partnership with Joe Mennie pushed his county to 439-9 declared which was a highlight for the Player of the Month, and he is aiming to gain his first victory of the season against Somerset.